It is not uncommon to encounter snakes while in the outdoors. What is uncommon is for people to react to the presence of a snake with calm. Most people fear snakes because they do not understand them or their importance in the natural world. While several species are potentially dangerous to humans, most are harmless creatures that form vital links in their ecosystems as highly efficient predators of rodents. Common sense is the best protection against dangerous species when afield: watch where you place your hands, where you place your feet, and where you sit. If you find a snake LEAVE IT ALONE! Purchase a field guide for identification of the various species. Enjoy the outdoors by learning more about these fascinating animals. Snakes are reptiles of the order Squamata, closely related to lizards. They are cold-blooded, limbless, scaly and narrow-bodied; some are venomous. Sidewinder -- Venom is of moderate toxicity. Human lethal dose is 40 mg and people have died from envenomation. Average venom delivered per bite is 20-63 mg. Venom is still lethal to mice and cats after 27 years of storage. Venom causes deep tissue necrosis at site of bite. Speckled rattlesnake -- Venom is very potent. Minimum lethal dosage for 350 gram pigeon is 0.002-0.04 mg, for mice 0.05-0.12 mg. Adults contain up to 227 mg of venom (dry weight) but inject 0.16 mg. Dried venom potency undiminished after 27 years storage. Red diamond rattlesnake -- Long fangs (over 1/2 inch). Low in toxicity compared to other rattlesnakes but this is a large species capable of delivering large amounts of venom. Lethal dose for people is about 100 mg and 150-350 mg (up to 1.65 ml) is delivered per bite. People have died from envenomation. Lethality of venom decreases only slightly after 27 years, producing complete neuromuscular block of a cat diaphragm in 22 minutes. Tissue damaging properties of venom are 6-15 times greater in adults than juveniles. In one case history an adult man spent 9 days in the hospital (antivenom was administered) following a bite to the leg and was able to walk almost normally in two weeks. Southern Pacific rattlesnake (western rattlesnake) -- Venom primarily hemorrhagic (affecting blood) but some subspecies contain neurotoxic components. 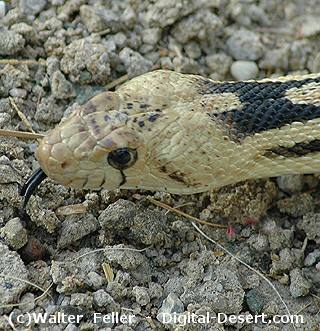 Toxicity of venom is greater than some larger species such as the western diamondback. This coupled with the high irritability of some individuals makes this a dangerous snake. Hemorrhagic, neurologic and proteolytic activity can all result from the same bite. Hemorrhagic activity in 18 minutes accompanied by some paralysis. Death in untreated cases may occur in 18 hours or up to 5 days. Lethal venom dose for humans is 70-160 mg and adults can produce up to 112 mg of venom (dried). Dried venom toxic to mice for at least 27 years. Western diamond back rattlesnake -- Fangs over 1/2 inch in length. Venom highly hemorrhagic. 53% of the enzymes cause breakdown of the circulatory system, 17% are neurotoxic, and 30% digest proteins. Hemorrhaging from vascular breakdown occurs in only 6 minutes. Stored venom loses little potency after 17 years. Lethal dose to humans is about 100 mg and snakes may contain up to 300 mg (dried). One snake yielded 1,145 mg (3.9 ml liquid)! This species probably responsible for more human deaths than any other snake in the U.S. Symptoms following bites include intense burning, vomiting, breathing difficulties, lowered blood pressure, increased heart rate, and secondary gangrene infection. Mojave rattlesnake -- Neurotoxic venom is extremely virulent (10 times more toxic than any other rattlesnake in the U.S.) affecting heart, skeletal muscles and neuromuscular junctions. Once bite sufficient to kill a human: lethal dose is only 10-15 mg and one adult can yield 141 mg (dried). Death occurs in a high frequency of untreated cases. For additional information see Ernst, C.H. 1992. Venomous reptiles of North America. Smithsonian Institution Press, Washington, D.C.